In 2012, Wendy Walker came to the conclusion that, while she liked her dentist, she just wasn’t happy with her smile. As the owner of a successful recruitment consultancy it was a problem that was both a business and personal concern. After weeks of looking for a practice that offered the latest cosmetic treatment at a reasonable price, it was Wendy’s husband who discovered WeLoveTeeth. He suggested Wendy pop in for a consultation. Dr Brennan often finds that an initial consultation is most productive when it is away from a clinical environment. WeLoveTeeth has a relaxing space where anyone can talk about their hopes or fears without a dental chair in sight. An iMac is the only piece of equipment that is used to explain the many treatment options available. Wendy admitted she disliked her teeth so much that it sometimes prevented her smiling. “My dream was to have a whiter smile that looked natural while allowing me to eat whatever I liked. I didn’t want an artificial Hollywood smile but I was prepared to go for a permanent solution like dental implants”. Dr Brennan arranged Wendy’s first clinical appointment which included a series of digital x-rays using her NOMAD; one of the only hand-held devices of it’s type in the world. “It looks a little like a science fiction ray-gun,” says Paula with a smile. “But it’s a fantastic piece of equipment for quickly seeing beneath the surface of every tooth. I couldn’t be happier. I no longer worry about smiling and I certainly don’t have to compromise what I eat because of my teeth. 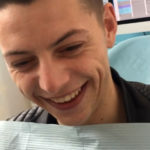 I am so glad that I discovered WeLoveTeeth because they have finally helped me to love my own. Dr Brennan also took intraoral photographs and scans, so that models could be built of Wendy’s teeth and gums. With her homework done Dr Brennan carefully put together a treatment plan that was presented to Wendy. Every treatment stage was explained in detail together with alternatives and the costs involved. The first decision for Wendy was an easy one… Joining WeLoveTeeth’s Membership plan. 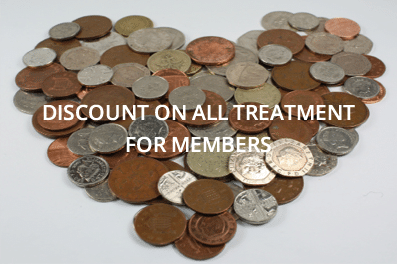 With a discount on all treatment she would immediately save enough money to get the first year of membership for free! 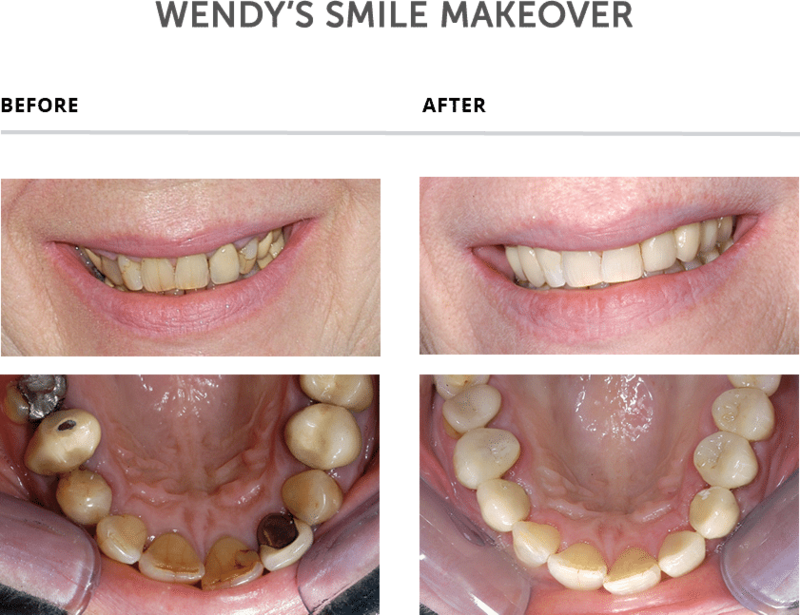 Wendy’s treatment began without Dr Brennan focussing on her teeth at all. Instead she carefully worked on her gums through a process of cleaning and disinfection. “Every patient can now benefit from our Airflow system,” she explains. “There is no need for me to use sharp instruments at all. 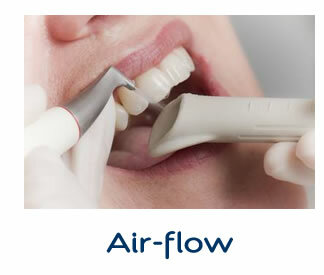 Airflow simply uses water, air and a fine jet of powder to remove the bacteria which can lead to gum problems”. With Wendy’s gums in great condition she was ready to have her natural teeth whitened. The transformation was remarkable. Dr Brennan used the Enlighten teeth whitening system to achieve a result that was a full 10 shades lighter. Wendy could then wave goodbye to her grey coloured amalgam fillings. These were replaced with a combination of porcelain and ceramic inlays that were precisely colour matched to her newly whitened natural teeth. Dr Brennan is keen to talk about one of her most impressive pieces of technology – CEREC. “Traditionally patients have often booked multiple appointments while a dental laboratory sculpted inlays or crowns. 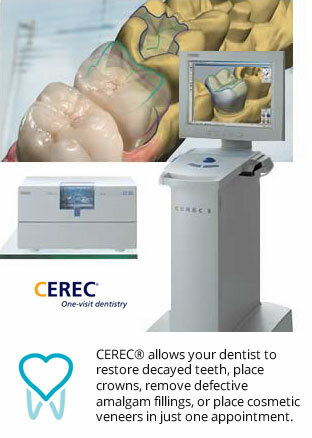 Our CEREC machine uses 3D scans of each tooth that are wirelessly sent to a robotic milling machine. In another room in the practice this machine sculpts a solid block of ceramic into something that perfectly fits the patient's tooth. And it all happens while they read a magazine downstairs or catch up on the news. At over £70,000 the equipment doesn’t come cheap but the convenience for patients is worth every penny”. To compliment her natural teeth Wendy opted for pure ceramic crowns with no visible metal. The final stage of treatment began with a Cone Bean CT Scan to allow planning of Wendy’s Dental Implants. Dr Brennan extracted two teeth that were replaced with Implants that literally look as good as new. Dr Brennan worked with her specialist Dr Asif Hamid to replace two of Wendy’s teeth with Implants that literally look as good as new. Throughout her treatment Wendy was offered the option (which she often didn’t require) of pain relief using The Wand. 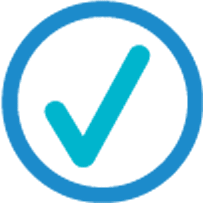 Yet another innovative option at WeLoveTeeth, The Wand avoids that use of a syringe, to deliver anaesthetic without the needle phobia that many patients worry about. The final result was everything that Wendy had dreamed of. WeLoveTeeth can transform someone’s smile whatever their age. So if you are you concerned about missing, damaged or crooked teeth don’t put up with them any longer. Just pop in for a chat with Dr Paula Brennan.